One of the lessons of the Montessori´s Method is the preparation of the environment of learning of the child. This includes his relation with the nature, animals and plants. Children who are raised seeing animals around them are good listeners, have good character and practice responsibility, compassion and respect for the creation. Also, kids who work regularly with animals may perform well in school and get along with other children better. As Montessori says: “nothing can substitute for walking in the woods and listening to birds, looking for shells on the beach, watching the daily growth of a flower in the garden. From the very beginning of life it is vital to maintain the link between the child and nature”. The model of behavior that parents and guides show to the children on the conviviality with animals is a very important factor. It is necessary to make them know that there are many alive different beings in the planet and have special characteristics depending on the geographical place where they live. Parents can go outside with the family to watch free animals as birds, squirrels, rabbits, dogs, even insects, all of them have distinctive features to learn. Children can repeat the names of the animals and observe how they act, feed, fly or move in nature. It doesn’t matter the season, in any weather it is an experience for the child to spend some time in the outdoors and visualize the changes in the environment. An excellent activity is to watch birds using binoculars and then to complete the information with books, cards or drawings at home. In case of the insects, the magnifying glasses can turn out to be entertained for children who will discover many new things that cannot be seen to simple sight. Some families could have the privilege of having a pet in the house, in that case the little ones can develop interesting skills as they take care of the animal. Some Montessori principles as responsibility and independence can be emphasized allowing the child to make small decisions on his pet. As Montessori wrote: “solicitous care for living things affords satisfaction to one of the most lively instincts of the child’s mind. Nothing is better calculated than this to awaken an attitude of foresight”. Tell your kids stories about the pets you had in your childhood or those marvelous experiences you remember having fun outside, in the nature. 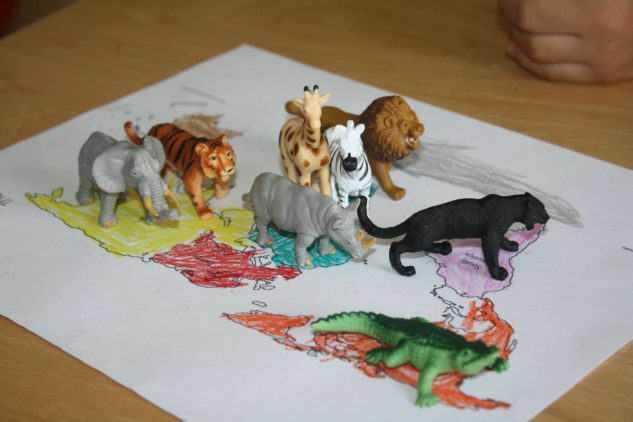 Teach your child to discover footprints of animals and then reproduce them at home in playdough. Make your children connect the animals with the continent to which they belong. Tigers, elephants and giraffes to Africa, kangaroos to Australia. Try to have books, cards, drawings, little figures of different animals, so your children can compare and learn the features of each one. Teach your children the different habitats of animals and how they adapt to them, then make your kids do the matching work using drawing cards.